For my husband and I, owning and operating Holden House Bed & Breakfast Inn located in Colorado Springs, has become a rewarding career combined with hard work and dedication. 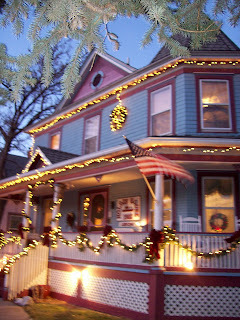 In 1986 when we opened Holden House, we were one of three professional B&B’s in the Colorado Springs area. Now the Pikes Peak Region boasts nearly 40, and the western states continue to see a large increase in the number of new B&Bs. It’s estimated that in 1982 there were 1,200 inns serving 1 million guests and a comparison in 1998 showed 40,000 inns serving 38 million guests, grossing $2.1 billion in room sales. The dream of owning and operating a bed & breakfast inn is one of the most desired professions. Innkeepers, former innkeepers and specialized real estate brokers have turned to consulting to increase research information and professional attitudes toward innkeeping. Inn consultants are a profession within a profession. Many innkeepers have written books on the subject and aspiring information has increased tremendously in recent years. It’s still amazing to me how many people wake up one day and think, “Let’s open a bed & breakfast! It will be fun to entertain guests in our home…we can do that!”. But, you don’t just—“build it and they will come.” While you’ve enjoyed staying at B&Bs, you haven’t noticed the behind the scenes work, mounds of paperwork, interruptions during the day and piles of laundry waiting to be finished. There are many aspects to consider when discovering whether innkeeping is for you. The industry is very personal, personal because innkeepers are involved with every facet of daily operations. Daily routines combine early rising, cooking, cleaning, shopping, laundry, bookkeeping, marketing, check-ins, reservations, management, and more—every day! Trading an 8-hour, five day a week job for a bed & breakfast seems like fun, until it becomes seven days a week with 18-hour workdays and an office you can’t escape. However, it does have its benefits. Acting as a “goodwill ambassador” is very rewarding. The freedom of owning your own business gives you the pleasure of not answering to anyone but yourself and your guests. It also offers a ‘stay at home’ business, beneficial to the single or married entrepreneur. As inn consultants, we feel there is a responsibility toward aspiring innkeepers. With the increase of professionalism in the B&B business, inn consultants must also present a professional attitude. Inn consultants should have experience based on number of years in operation, have organizational skills and have an extensive background with industry resources. • What is your experience within the B&B industry? • How long have you been in the B&B business? • How long have you been teaching seminars/consulting? • What are your specific strengths in inn consulting? • How long did you research before opening your B&B? • Do you attend continuing education conferences & seminars? • How long have you been in real estate? • How many B&B’s have you sold? • How many B&B’s have you stayed in? • Have you ever operated a B&B? • What is your experience within the B&B industry and what experience do you have with zoning and planning regulations? It’s important for aspiring innkeepers “jump start” their success by researching first. This provides an informed decision regarding the property, set-up, financing, operations, and general planning. If you’re starting in an area with few or no B&Bs, you’ll become the educational expert if you’ve researched. You’ll save money in the long run by learning from the other’s experiences. Today’s wealth of books and seminars provide prospective innkeepers with the opportunity to learn from experience. Potential innkeepers who do their homework find it easier to start and operate successful bed & breakfasts. Working as an apprentice offers a realistic view into daily inn operations. Unlike days of the past, financial institutions will insist that applicants have researched the industry prior to bank loan approval. Lenders want a solid research background and formal business plan. Our B&B consulting business was developed when we started receiving many individuals who were inquiring about the business side of innkeeping. In turn, we developed our “Starting Your Own Bed & Breakfast Inn” seminar in 1989 through the Small Business Development Center. Now, each year, we coordinate an Aspiring Innkeeper Day in conjunction with the Bed & Breakfast Innkeepers of Colorado (BBIC) conference. This one-day seminar provides a basic overview and practical information on setting up, operations, marketing, and planning. We also offer private consulting is offered on an hourly basis for those requesting individual attention & specific needs. This year, the annual bed and breakfast conference will be held in Golden, Colorado on Sunday, November 8th with the association conference taking place on the 9th. For more information, check the website at http://innsofcolorado.org/and click on “Conference”. Existing inns and bed & breakfast associations should be used as research and educational resources. Aspiring innkeepers should stay at B&B inns, offer to pay the innkeepers for extra time. In turn, they’ll gain valuable information on inn operations and develop a model for their own B&B. State and local organizations are also an important support system for networking, education and quality assurance. Attending state conferences offer a wealth of information to a would-be innkeeper. When my husband, Welling, and I saw the need for bed & breakfast networking in 1987, we founded Colorado’s B&B association, “Bed & Breakfast Innkeepers of Colorado”. Since that time, the association’s annual Colorado conference has become a great educational tool for both aspiring and current innkeepers. Most state associations also offer associate memberships for aspiring innkeepers. This provides an excellent support and networking base, even if you don’t yet own a B&B inn. It keeps you in the mainstream of that state’s B&B information network. And, make sure you’re added to any subscriptions for B&B newsletters, whether for marketing or innkeeping tips, they keep you in touch with the industry. Make sure that you’re penny wise when researching by spending dollars to stay in B&Bs, buy books on the subject and take as many business related classes and seminars whether geared toward operating an inn or a small business. It’ll save you money if first, you decide to open a B&B or second, you decide it’s not the right job for you. Perhaps you’ll discover you just love staying in B&Bs and that’s just fine for those of us in the business! Sallie & Welling Clark can be contacted at Holden House 1902 Bed & Breakfast Inn, 1102 W. Pikes Peak Avenue, Colorado Springs, CO 80904 Email: mail@holdenhouse.com Website: www.holdenhouse.com (719)471-3980. The Clarks have written several books on the industry, “Colorado’s Bed & Breakfast Industry and Marketing Analysis of a Small Inn”, and Sallie co-authored the book, “Innkeeper to Innsitter through the Eyes of Experience” with innsitter-consultant Lynn Mottaz. Aspiring Information is available on the Holden House website at https://www.holdenhouse.com/ Check out the Holden House Gift Shop for B&B books and information. This entry was posted in aspiring, B, bed, breakfast, classes, conference, inn, innkeeper, seminar by admin. Bookmark the permalink.